It might be easier to understand budgeting money by paychecks if we walk through an example. Let's use the example we began during Creating A Household Budget/Step 2: Income. We have a two-earner household of four with an annual income of $78,000. Pay periods are bi-weekly and weekly, but we decided to use a bi-weekly budget period. That means the $500/week one spouse earns is counted as $1000 for each budget period. Now that we know what our income and expenses are, we can begin budgeting money by paycheck, and learn whether or not we're living within our means. 1. Begin by calculating how much to set aside for annual expenses. Here we include not just fixed annual expenses, but categories for items like Christmas and vacations. Our couple wants to pay for everything in cash, and realizes they need to set money aside every payday in order to have enough when December rolls around or the beach is calling. Now our $3000 paycheck is reduced by $556 for annual expenses, leaving $2444 left to spend every payday. 2. Calculate how much to set aside to account for semi-annual expenses. We'll divide the semi-annual bill by 13 pay periods, which is half a year. Now we're down to $2390 available to spend from each paycheck, after accounting for semi-annual expenses. 3. Move on to fixed monthly expenses. Remember, fixed expenses are the same each time you're billed, give or take a few dollars. 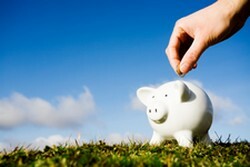 TIP: If your utility company offers a budget plan, take advantage of it! Nothing can bust your budget faster than a really cold winter or a really hot summer. Monthly expenses have to be handled a bit differently. If you have a bi-weekly budget period, some monthly amounts are large enough to divide in two and allocate to one of two paychecks a month. Now we're down to $930 available to spend from each paycheck, after accounting for regular, fairly fixed monthly expenses. 4. Move on to variable (or discretionary) monthly expenses. In Step 3 of our budgeting process we show you how to work with your spending. You should have a list of all your variable, or discretionary, expenses as well as how often you spend them. These expenses must also be allocated to each budget pay period. Good news! We have $573 per paycheck left over after accounting for all our expenses, including Christmas and vacation. 4. Allocate a surplus to debt, saving or investing, or increase budget categories. Fix a deficit by reducing expenses until you reach zero. Now there's $573 left over each payday. After talking it over, our couple decides tpay off that student loan as quickly as possible, as well as contribute enough to their 401(k)'s to qualify for full employer matches. The couple also wants to start college funds for the kids to the tune of $200 a month. The remaining balance needs to go into savings to establish 3 to 6 months' living expenses, in case either spouse is unable to work. The budget's bottom line is now zero, also known as "zero-based budgeting". By breaking all spending down into pay periods, can you see how easy it was to even out cash flow and get a realistic picture of where the money is going? Notice this couple will have cash on hand for Christmas, vacation, gifts, and home and auto maintenance. They're also certain to save each month for college, retirement and rainy days. How Do I Manage A Paycheck-Based Budget? A terrific way to manage your budgeting by paycheck system is to set up two checking accounts (one for fixed expenses, and the other for variable expenses. You should also set up a separate savings account for each of your major savings goals (rainy day fund, Christmas, vacation, new car, etc.). Get paid by direct deposit, and automatically transfer your budgeted amount into the proper accounts. You can also do transfers with online banking. Your "fixed expenses" checking account can be used to pay bills by check or online bill-pay. Your "variable expenses" account can be used to for purchases by debit card, to pay off a credit card in full each month, or for ATM cash withdrawals. Use can also use an envelope budgeting system for variable expenses, only spending cash you put in the envelopes every pay day.